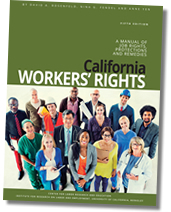 A basic overview of the legal protections for workers under California and federal law, written in understandable language, designed for use by workers and those who represent them. The California Workers’ Rights covers significant changes to the laws governing wage theft, Workers’ Compensation, family leave, disability rights, and more, as well as major cases governing important rights like meal and rest breaks. Compatible with Apple iPad/iBooks, Nook, Sony Reader, Kobo, and most e-reading apps including Stanza, Aldiko, Adobe Digital Editions, and others. This is an open-source EPUB e-book format. For multiple copies, please submit multiple orders. This is a MOBI e-book format compatible only with Amazon Kindle. Return Policy: Unused books may be returned within 30 days of purchase for a full refund. Beyond 30 days, a 15% restocking fee may be applied.